The 1965 Major League Baseball season. The Houston Colt .45s became the Astros, as they moved from Colts Stadium to the new Astrodome, becoming the first team to play their home games indoors, rather than outdoors. It was also the final season for the Braves in Milwaukee, before relocating to Atlanta for the 1966 season. The Los Angeles Angels officially changed their named to California Angels in advance of their pending 1966 move to a new stadium in Anaheim. April 12 – The first official game at the Astrodome is played in front of over 43,000 fans, as they watch the Philadelphia Phillies defeat the host Astros, 2–0. June 8 – The first Major League draft is held for high school and collegiate players. The Oakland Athletics use the first overall pick to draft Rick Monday. In the tenth round, the New York Mets select Alvin, Texas high school pitcher Nolan Ryan. July 13 – At Minnesota, Willie Mays hits a home run with two walks and two runs to pace the National League to a 6–5 All-Star Game victory over the American League. Juan Marichal pitches three scoreless innings to earn Game MVP. August 19 – Jim Maloney walks ten Cubs, none of whom score. Leo Cárdenas hits a home run off of the Wrigley Field's left field foul pole in the tenth inning for the game's only run; winning the no hitter for Maloney. It was Maloney's second 10 inning no-hitter of the season; he lost the first one 1–0 when the Mets scored a run on two hits in the bottom of the 11th inning. August 22 – A game between the Los Angeles Dodgers and San Francisco Giants at Candlestick Park turns ugly when San Francisco's starting pitcher, Juan Marichal, batting against Sandy Koufax in the third inning, attacks Dodgers catcher John Roseboro with his bat. Both benches clear and a 14-minute brawl ensues, before peacemakers such as Koufax and the Giants' Willie Mays restore order. A shaken up Koufax then gives up a 3 run homer to Mays and the Giants win 4–3 to retake 1st place. National League president Warren Giles suspends Marichal for eight games and fines him $1,750, and also forbids him to travel with his team to Dodger Stadium for the final series of the season against the Dodgers. Although the Giants take both games during a 14-game winning streak, the Dodgers would go on to win the pennant, using a 13-game winning streak of their own to clinch the pennant over the rival Giants on the season's next to last day. September 2 – Ernie Banks hits his 400th career home run helping the Chicago Cubs beat the St. Louis Cardinals 5–3. September 9 – At Dodger Stadium, a duel between the Los Angeles Dodgers' Sandy Koufax and Bob Hendley of the Chicago Cubs is perfect until Dodger left fielder Lou Johnson walks in the fifth inning. Following a sacrifice bunt, Johnson steals third base and scores on a throwing error by Cubs catcher Chris Krug. Johnson later has the game's only hit, a 7th-inning double. Koufax's fourth no-hitter in four years is a perfect game, the first in Dodgers history. One hit by two clubs in a completed nine-inning game is also a major league record, as is the one runner left on base. The two base runners in a game is an ML record. For Chicago pitchers, it is the second one-hitter they've thrown against the Dodgers this year and lost. A week later in the rematch in Chicago's Wrigley Field, Hendley beats Koufax and the Dodgers, 2–1. September 13 – The San Francisco Giants' Willie Mays' hits his 500th home run off the Houston Astros' Don Nottebart, and Juan Marichal earned his 22nd victory as the Giants beat Houston 5–1 at the Astrodome. The win is the Giants' 11th straight and gives them a two and a half game lead. September 16 – On the same day Pinky Higgins is fired as Boston Red Sox general manager, Dave Morehead no-hits the Cleveland Indians 2–0 before only 1,247 fans at Fenway Park. Not until Hideo Nomo in 2001 will another Red Sox pitcher hurl a no-hitter, and the next Fenway Park no-hitter won't come until 2002 (Derek Lowe). September 25 – Though he has not pitcher in the Major Leagues since 1953, the Kansas City Athletics send Satchel Paige to the mound. At (approximately) 59 years old, he is the oldest pitcher in Major League history. In three innings, he strikes out one, and gives up one hit, a single to Carl Yastrzemski. Paige does not earn a decision in the loss to Boston, 5–2. September 26 – The Minnesota Twins gain their first American League pennant since moving from Washington in 1961, ironically by defeating the expansion Washington Senators 2–1 at Washington's D.C. Stadium (which was renamed "Robert F. Kennedy Stadium" in 1969). Minnesota's Jim Kaat (17–11) wins the clincher. October 2 – Sandy Koufax wins his 26th game as the Dodgers beat the Braves 2–1, for their 14th win in their last 15 games as they clinch the N.L. pennant. October 7 – Jim Kaat gives Minnesota a 2–0 World Series lead by driving in two runs, defeating Sandy Koufax and the Los Angeles Dodgers 5–1 at Minnesota's Metropolitan Stadium. The game is remembered for Minnesota's Bob Allison remarkable sliding catch of a Jim Lefebvre line drive in the wet grass of Metropolitan Stadium. October 14 – Working on two days rest, Sandy Koufax strikes out 10 and throws a three-hit, 2–0 shutout against the Minnesota Twins in Game Seven of the World Series, giving the Los Angeles Dodgers a second World Championship in three years. Lou Johnson's 4th inning leadoff home run off the left field foul pole gives Koufax the only run he'll need. A Ron Fairly double and Wes Parker single in the same inning add an insurance run to account for the 2–0 final. 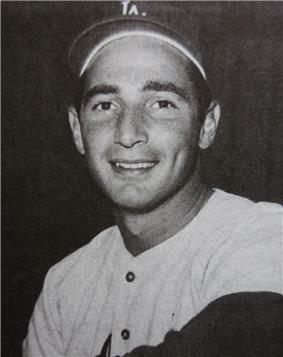 Koufax, who threw complete game shutouts in games 5 and 7, is named Series MVP. November 26 – San Francisco Giants pitcher Frank Linzy (9–3, 43 strikeouts, 1.43 ERA). December 9 – Frank Robinson is released by the Cincinnati Reds. He will soon be signed by the Baltimore Orioles, and will win the MVP Award in the American League the next year.